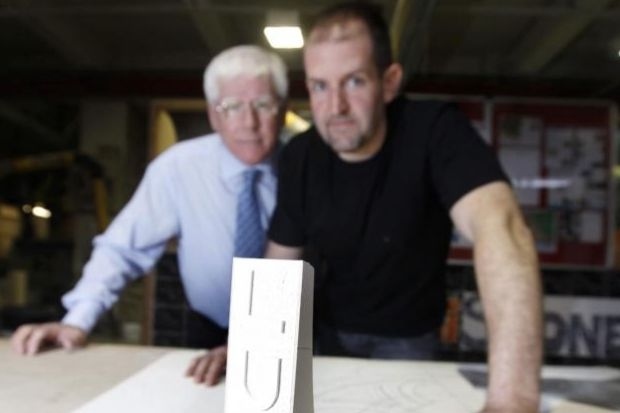 Lecturer John Halpin, left, casts his expert eye over Alec Keeper’s planned Burns memorial. Photographer Alec Keeper has carved out a whole new career by designing a modern memorial to Robert Burns. Having swapped his camera for a chisel to train as a stonemason at a Glasgow college he’s designed a granite and sandstone tribute to our national Bard. Alec won a competition to design a new Burns memorial which will stand just yards from Bridgeton Cross, which is undergoing a £1 million renovation. Bridgeton Burns Club commissioned the work last year to mark the 250th anniversary of the birth of Burns. Alec, 38, was inspired by the Bard’s nickname – ‘the ploughman poet’ – and has designed a stone pillar more than six feet tall which bends in the shape of a ploughshare. Alec, from Dennistoun, and his fellow student expect to complete the memorial by the time the new-look Bridgeton Cross is unveiled in June. The work will be created under the watchful eye of John Halpin, head of building trades at the college. The club has contributed £1,000 to the £15,000 cost of the memorial, which will be funded from the overall scheme’s £1.1m budget.